This is the Perfect Royal Wedding Hat, and we have many, many more in stock. Just look through all the different Hat Categories like Ladies Hats, Derby Dame Hats, Tea Party Hats or Gentlemen’s Hats. What we have posted is just a fraction of the thousands of Hats for the Royal Wedding that we have in stock. Prince Harry & Meghan Royal Wedding Watching Parties on May 19, 2018. Dallas Vintage Shop is ready for you. We’ll get you ready for the Royal Wedding with more Fancy Royal Wedding Hats than anyone in the Dallas, DFW or the entire North Texas Area. You will find plenty of Royal Wedding Watching Party Hats. 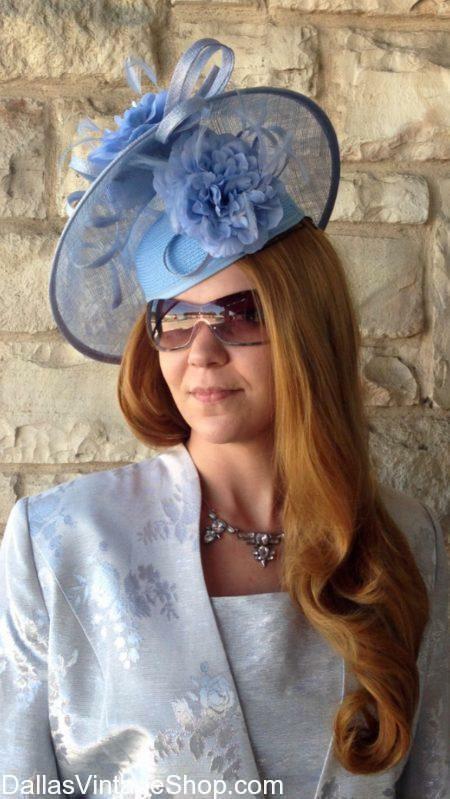 We have HIGH SOCIETY STYLE Hats, Sophisticated Lady Fashion Hats, AVANT-GARDE Royal Wedding Hats, Queen of England Style Hats and WHIMSICAL FASHION Hats that will give you the Royal Wedding look you want. You may want more safe but fashionable Royal Wedding Hats or wild and cutting edge MILLINERY MIRACLE Hats. Maybe you prefer Preppy English Royal Wedding Hats or ENGLISH TEA PARTY Hats. There is no limit to the styles of Royal Wedding Party Hats we have in stock. Get Royal Wedding Watching Parties for Royal Wedding Hat Wearers. Get Royal Wedding Hat Ideas. Get Royal Wedding Hats for Men.